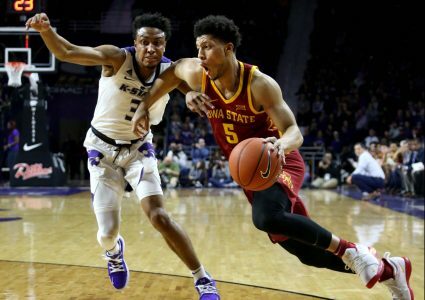 Lindell Wigginton had a bit of a rough start behind the 3-point line after returning from injury, most notably his shooting percentage behind the 3-point line. But it seems that trend is swinging back in a more positive direction to match more closely to the 40 percent shooter we saw a year ago. 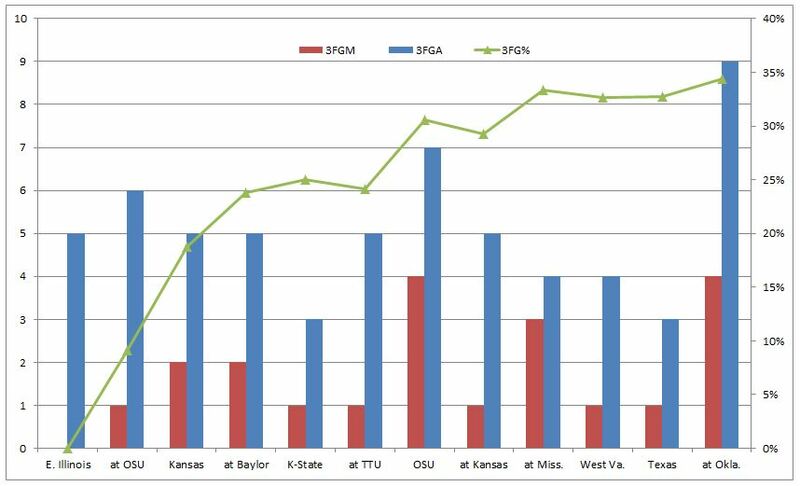 Below is the game by game 3-point shooting for Wigginton since returning showing his makes, attempts, and cumulative percentage with each game (green line and the secondary y-axis to the right). This isn’t earth shattering but it is a nice visual representation of the numbers on how his shooting is coming along and getting back to an impressive rate. The defensive presence of Cam Lard has been talked about a lot, especially in terms of the dimension he can bring that no one else on the roster can quite like him. With the lineup data I’ve been collecting, I can now quantify his impact on defense. 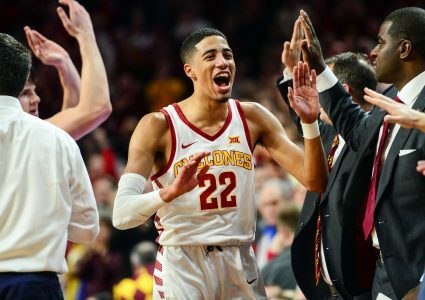 Above is the comparison of Lard, Michael Jacobson, and George Conditt when they’re in the game for the past 11 Iowa State games. The “CL2” are shots that are at the rim by way of layups or dunks and the “CL2A%” is the percentage of attempted shots that are “close” versus longer jump shots. But when Lard is in the game, opponents are making just 44 percent of their attempts at the rim instead of the 53 percent with Jacobson or 57 percent with Conditt. 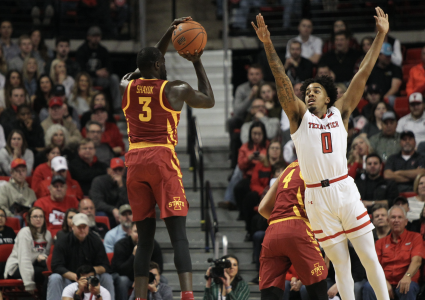 When Lard is in the game, the Cyclones are blocking 23 percent of opponent 2-point shots, another drastic hike. That percentage comes from 19 total blocks, 15 of which have come from Lard. Yeah, that’s not really a word and you may not know much about it but it is essentially an overall player rating that is based on value above an average replacement player that is tracked at barttorvik.com. There he not only has an overwhelming database of player and team stats but also allows for customizable charts. It is very much similar to KenPom but there are some notable differences. Anyway, the topic from his site for this week is a chart of Iowa State’s players on their minute percentage versus their individual PORPAGATU! rating. It may be a bit challenging to read, and minute percentage is a bit skewed because of all the games that Wigginton and Lard missed but the five starters are all up and to the right meaning the best players are getting the most minutes… which is a good thing, and expected. Wigginton is the highest non-starter but not yet caught up on minutes and it is a similar story for Lard. There are some light dots in the background that are all other Big 12 players. But, yes, that is Tyrese Haliburton way at the top leading the league. I’m still tinkering around with some of this stuff as the sample size slowly increases to a more meaningful baseline. But, it’s always been an interest so I’m antsy to share some deeper stats than just scoring efficiencies. Keep in mind the small sample size and that of these seven most common lineups, only two have a sample size larger than an average Iowa State game by number of possessions and we all know one game sample sizes are dangerous. Regardless, this is sorted by number of possessions but then shaded from good (red) to not as good (blue). Most notable to me is that the Marial Shayok, Tyrese Haliburton, and Lindell Wigginton combo has two of the top three lineups by 3-point percentage. 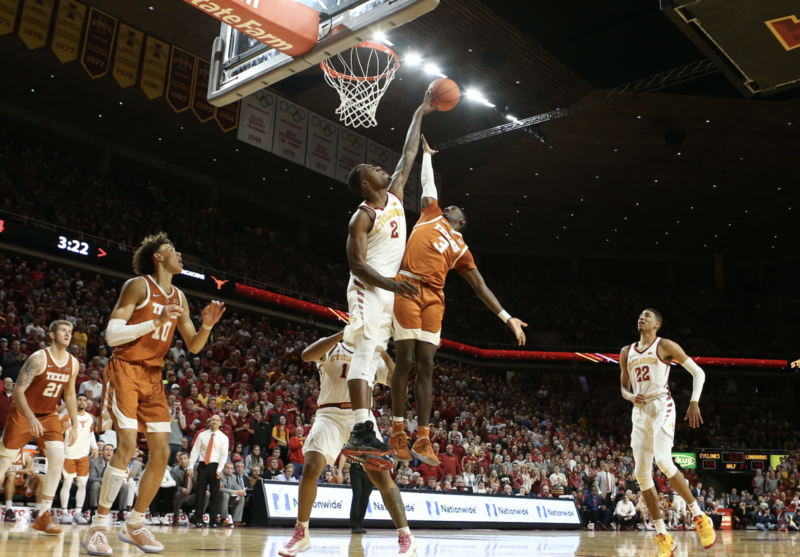 Also the three man combo of Wigginton, Shayok, and Talen Horton-Tucker are in the two lineups that take many, many more shots at the rim which is to be expected with how much they attack the paint. Kirk has been a contributor at Cyclone Fanatic since the fall of 2009 and is a lifelong Cyclone fan. He eventually started his own website, enCYCLONEpedia.com, where he cultivated an interest in statistical analysis and historical Iowa State football and basketball data. In 2014, Kirk came to Fanatic and housed his works here. In 2015 he launched a new website, cfbanalytics.com, as the co-founder. There you can find in depth analysis of all things involving advanced statistical analysis in college football for every FBS program. Kirk graduated from Iowa State University in 2006 with a degree in Industrial Technology and has worked as a Manufacturing/Quality Engineer ever since. He's married to his wife, Kelley, and has three daughters, Hannah, Hayley, and Kinley (plus his Golden Retriever, Clyde).